What makes some teachers more effective than others? What pedagogies and practices are fads and which are backed with quality evidence? Which teaching strategies give teachers the biggest learning bang for their buck? 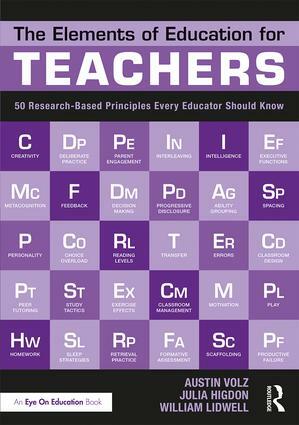 The authors have surveyed the research literature and carefully curated 50 elements of effective teaching—elements such as direct instruction, executive functions, metacognition, motivation, and scaffolding—to answer such questions and demystify the secrets of master teachers. Designed specifically for clarity and ease of use, this book is perfect for both new and experienced educators. Each element uses a consistent architecture: a simple definition, concise overview of the research, practical Dos and Don’ts for the classroom, and a select quote to inspire reflection. The Elements of Education for Teachers is an essential addition to any teacher’s library and important reading for teachers’ professional development. Austin Volz is Senior Learner-Experience Designer on the "Tiger Works" Research and Development team at Avenues: The World School. A recipient of both a Fulbright scholarship and Foreign Language and Area Studies Fellowship, Austin holds a bachelor’s from St. John’s College and a master’s from the Harvard Graduate School of Education. Julia Higdon is Senior Research Scientist on the "Tiger Works" Research and Development team at Avenues: The World School. Julia began her career as a teacher and holds a doctorate in education research from the Harvard Graduate School of Education. William Lidwell is Vice President of the "Tiger Works" Research and Development team at Avenues: The World School. He is the author of several books, including the best-selling Universal Principles of Design.